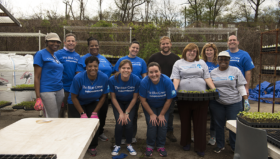 Philadelphia, PA — April 8, 2019 — Members of the Independence Blue Cross (Independence) Blue Crew, the company’s associate volunteer group, will be out in full force in celebration of National Volunteer Week, (April 7-15) which recognizes American volunteerism and the passionate people across the nation who dedicate their time and talents to serving others. The Blue Crew volunteering at City Harvest. 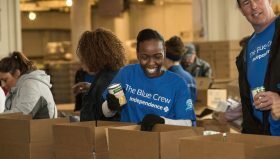 In April, Independence Blue Crew members were out in full force in celebration of National Volunteer Month, which recognizes American volunteerism and the passionate people across the nation who dedicate their time and talents to serving others. 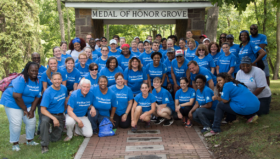 Associates volunteered nearly 1,900 hours at approximately 35 project locations to support community health, local children’s programs, and community improvement projects…. On March 21, the Cozen PAL Center in Fairmount opened its “Prom Boutique” to make prom night unforgettable for over 200 young shoppers. For the ninth consecutive year, the boutique provided students from PAL centers across the city with the total shopping experience. 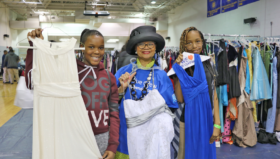 Blue Crew volunteers were there to help shoppers try on dresses, accessories, and shoes…. 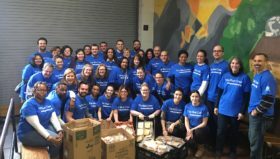 This week Independence Blue Cross associates from the Specialty Services and Product Development teams volunteered to make 1,000 peanut butter and jelly sandwiches for Saint John’s Hospice in Center City Philadelphia — all before starting their workday. More than 40 associates donated the ingredients and made sandwiches to be served later in the day at the center…. 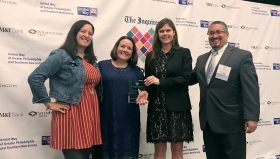 Philadelphia, PA – Independence Blue Cross (IBC) and its Blue Crew Corporate Volunteer Program were honored by Variety – The Children’s Charity at the Children’s Champion Gala on June 20 for IBC’s support and contribution to improving the lives of thousands of children with disabilities and their families in the Delaware Valley…. Independence associates celebrate the anniversary of our diversity and inclusion program with CEO Dan Hilferty. 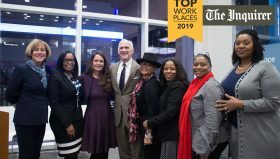 Philadelphia, PA — The Philadelphia Inquirer has awarded Independence Blue Cross (Independence) a Top Workplaces 2019 honor based on employee feedback. The anonymous survey measures several aspects of workplace culture, including how employees feel about company values and whether their job makes them feel part of something meaningful…. Pictured left to right: Eagles offensive lineman Jordan Mailata, Nick and son Jayden, join IBC Foundation president Lorina Marshall-Blake, SWOOP and Variety board member Jerry Bollenbach. 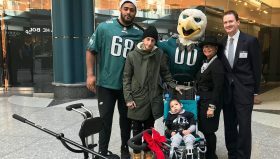 Volunteers from the Independence Blue Cross Blue Crew joined the Philadelphia Eagles and Variety— the Children’s Charity for a special pop-up gift-wrapping event at the Shops at Liberty Place…. From left to right: Independence associates Yasseline Diaz, Marie Gillespie, Courtney McDade, and Juan Lopez.